Autumn means it’s time to plant spring-flowering bulbs. This year why not try interplanting bulbs with winter flowers? It’s the perfect way to add some colour to your garden beds now while you wait for your bulbs to make their glorious appearance in spring. Plus, you’ll save yourself a lot of effort – you only have one garden bed to dig up, feed and keep watered and you’ll get double the results. Choose a sunny area of the garden with well-draining soil that is also easily accessible with a hosepipe – seedlings and bulbs require frequent watering. Prepare your soil well: Dig it up to a depth of about 30cm and add one bag of compost and four handfuls of fertiliser to each 4m2. Remove any grass, weeds or stones and rake the soil level. Water both the garden bed and the seedlings in their tray. Push the seedlings out of their trays from below (don’t yank on the plant) and plant them at the same depth as they were in the seedling tray. Plant individual seedlings in groups, with each group spaced far apart from the next (you’ll plant the bulbs in the spaces in between). 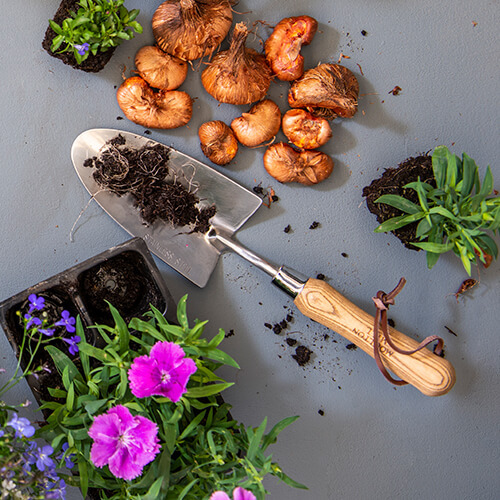 Once your seedlings are in the ground, it’s time to plant your bulbs. Plant these in clumps of 12–15 bulbs in the spaces between the seedlings. Follow the instructions on the pack, or our guide to growing spring bulbs, to determine how deep and far apart they should be planted. Water often with a fine sprinkler – bulbs need to be watered to a depth of at least 15cm twice a week. Feed your seedlings with foliar feed (like Multifeed or Nitrosol) every two weeks. Once the bulb shoots appear above the ground, feed with bulb food once every two weeks.